For other uses, see Vetluga (disambiguation). 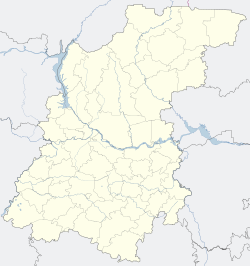 Vetluga (Russian: Ветлу́га) is a town and the administrative center of Vetluzhsky District in Nizhny Novgorod Oblast, Russia, located on the right bank of the Vetluga River. Population: 8,954 (2010 Census); 9,641 (2002 Census); 10,190 (1989 Census). It was founded in 1636 and granted town status in 1778. Within the framework of administrative divisions, Vetluga serves as the administrative center of Vetluzhsky District. As an administrative division, it is incorporated within Vetluzhsky District as the town of district significance of Vetluga. As a municipal division, the town of district significance of Vetluga is incorporated within Vetluzhsky Municipal District as Vetluga Urban Settlement. Государственно-правовой департамент Нижегородской области. Приказ №3-од от 27 января 2016 г. «Об утверждении реестра административно-территориальных образований, городских и сельских населённых пунктов Нижегородской области». Опубликован: "Нижегородская правда", №27(26048) (начало) и №30 (26051) (окончание), 19 и 26 марта 2016 г. (State Legal Department of Nizhny Novgorod Oblast. Order #3-od of January 27, 2016 On the Adoption of the Registry of the Administrative-Territorial Formations, Urban and Rural Localities of Nizhny Novgorod Oblast. ). Законодательное Собрание Нижегородской области. Закон №109-З от 28 сентября 2006 г. «Об утверждении границ, состава территории Ветлужского муниципального района и состава территорий муниципальных образований, входящих в состав Ветлужского муниципального района», в ред. Закона №197-З от 28 декабря 2011 г. «О внесении изменений в отдельные Законы Нижегородской области». Вступил в силу по истечении десяти дней со дня официального опубликования. Опубликован: "Правовая среда" №88(761) (приложение к газете "Нижегородские новости" №184(3596)), 7 октября 2006 г. (Legislative Assembly of Nizhny Novgorod Oblast. Law #109-Z of September 28, 2006 On Establishing the Borders and the Composition of Vetluzhsky Municipal District and the Composition of the Municipal Formations Within Vetluzhsky Municipal District, as amended by the Law #197-Z of December 28, 2011 On Amending Various Laws of Nizhny Novgorod Oblast. Effective as of the day after ten days from the day of the official publication have passed.). This page was last edited on 13 June 2017, at 11:17 (UTC).